Southern Illinois University Edwardsville honors their valued employees in a variety of ways throughout the year. Each spring, all employees are invited to an Employee Appreciation Day. Rotating themes set the tone for this fun and interactive event. The Employee Appreciation celebration is a wonderful way for employees to socialize and relax while enjoying lunch, games, activities and prizes. 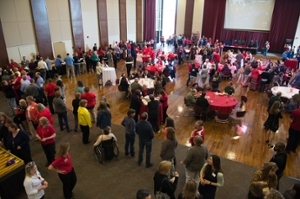 In December of each year, faculty and staff also are invited to a winter holiday reception. At this celebration, employees are treated to an afternoon of delicious appetizers and desserts with holiday entertainment provided by various students and staff of the Music Department. The Employee Recognition Program was established in July 1998 and is designed to recognize staff for their exceptional accomplishments and service to the University. Candidates for this monthly award are nominated by their co-workers or supervisors. One nominee is selected each month to be recognized University wide through digital signage, University and a departmental ceremony. Additionally, Southern Illinois University Edwardsville recognizes employees who have reached service milestones of 5, 10, 15, 20, 25, 30, 35, and 40+ years of service at the annual Service Awards Ceremony. Employees with 15 or more years of service to the University are also honored through the Builders of the University Plaza. Employee names appear as two per plaque on bricks that construct a winding wall, which stands as a testament of thanks to those who have dedicated their time and effort to the University's success.